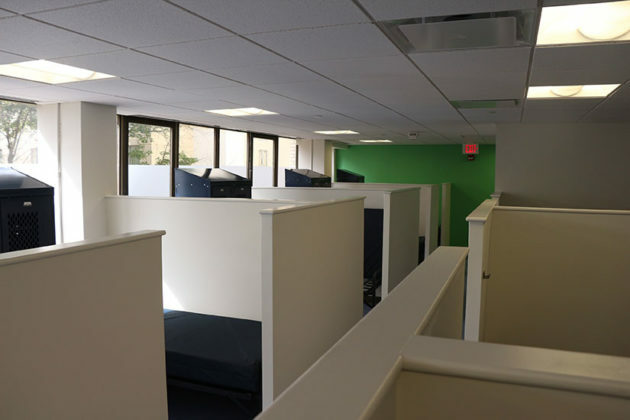 Arlington County’s new year-round homeless shelter will open its doors next week. 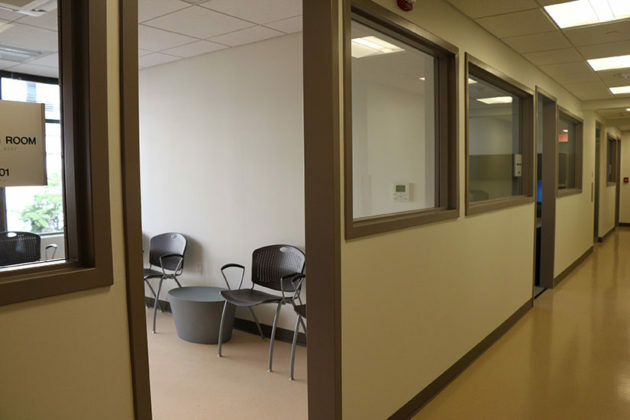 The Homeless Services Center officially opens on Oct. 1 with day programs and will start offering beds to the county’s homeless population on Friday, Oct. 2. 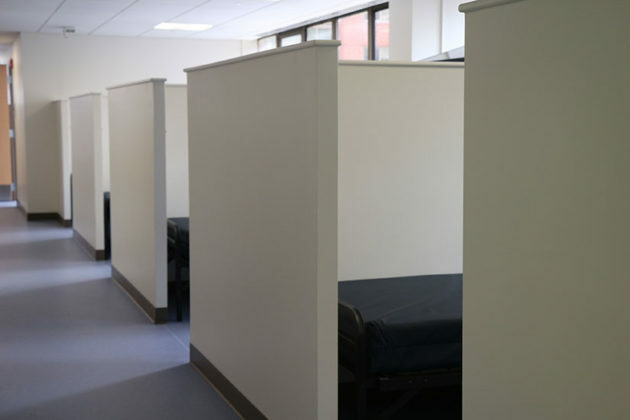 The new shelter has 50 year-round beds — 36 on the men’s side and 14 on the women’s side — and 25 “hypothermia prevention beds” for cold winter nights. 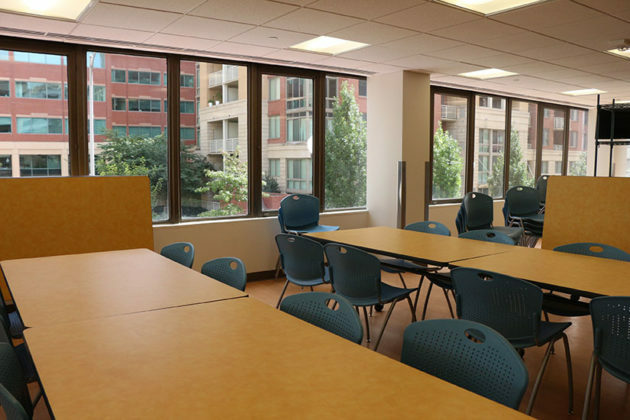 The center has a sitting room for people to relax or watch TV, a cafeteria serving meals around the clock and a classroom, where the shelter plans to hold job training, budgeting and art classes, said Kathy Sibert, the president and CEO of Arlington Street People’s Assistance Network. 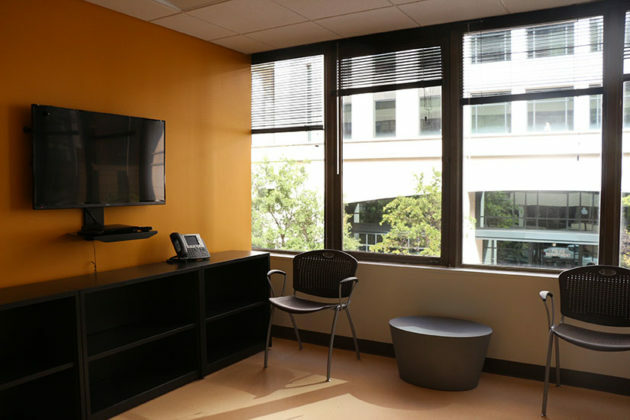 The shelter is colorful, with a bright orange wall greeting people as they approach the front desk. 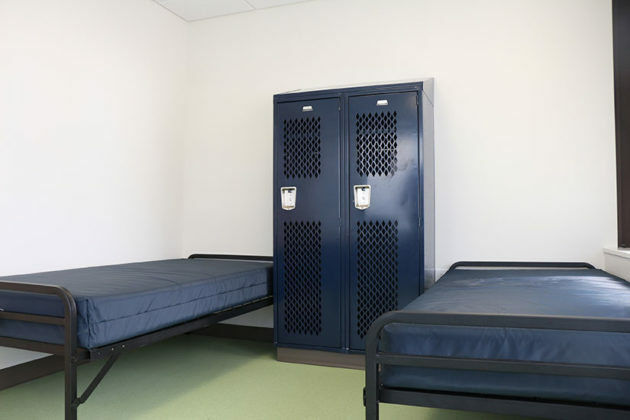 The bedroom walls are painted blue on the women’s side and green on the men’s side. Even the floors are colorful, with green tiling on the women’s side and blue on the men’s side. 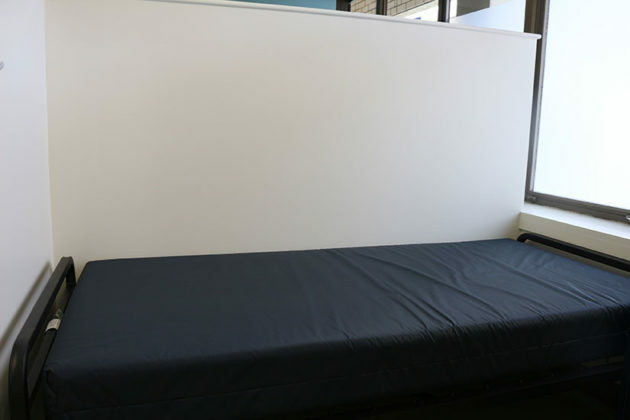 Macy’s will be providing sheets in blues and greens for the beds, Sibert said, making the accommodations slightly less spartan. 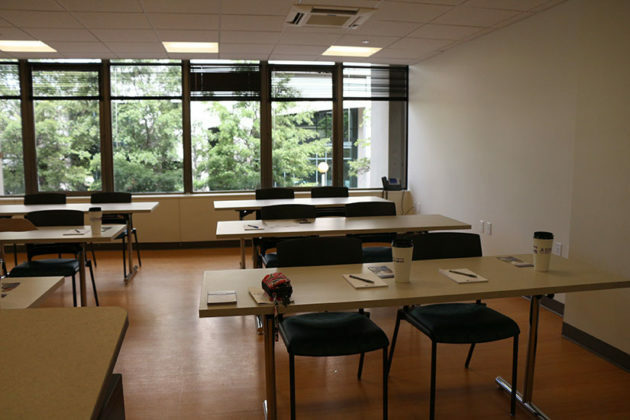 “Anita [Friedman], the director of Department of Human Services, and I were really intent that this wouldn’t look like an institute,” she said. The color extends to the bathrooms, which have blue or green tiles instead of gray, said Scott Miller, senior director of development at A-SPAN. 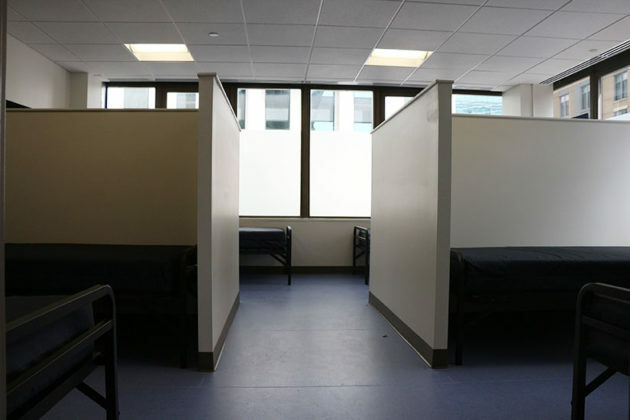 The center will replace the emergency winter shelter two blocks away in Courthouse, which was open from 4 p.m. to 9 a.m. Other homeless services, including meals, will also be done at the new shelter. 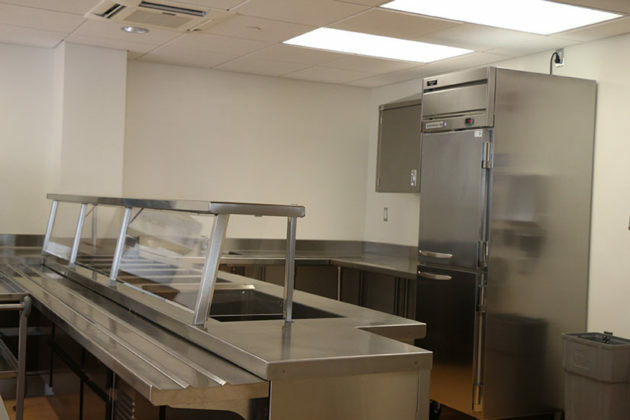 “We’re going to have everything in one place, which is awesome,” Sibert said. 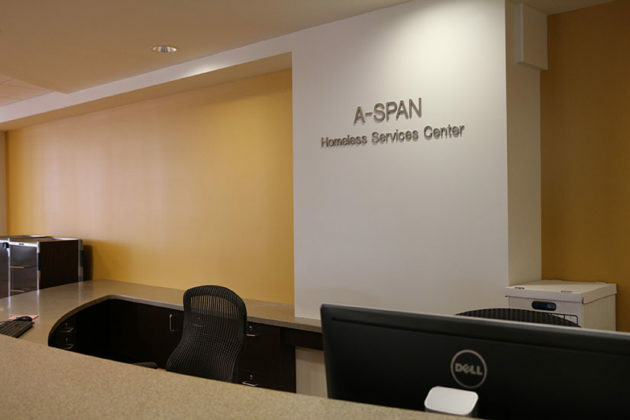 Having the shelter open 24 hours a day, seven days a week throughout the year means A-SPAN will rely on volunteers to help keep things running, in addition to the 30 A-SPAN staff members, Miller said. “We gobble up 15,000 volunteer hours here,” he said. 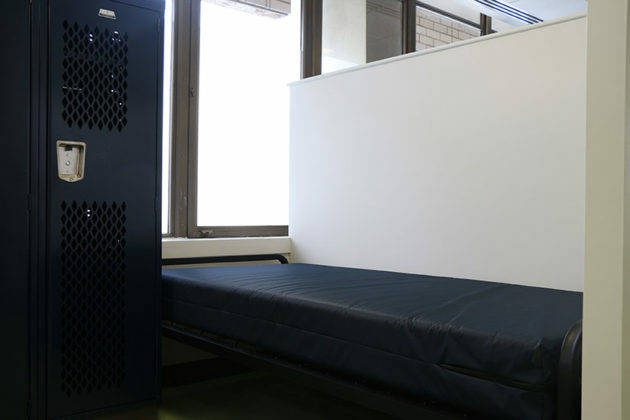 The new shelter is located directly across of the police station and near some Courthouse condominiums. Neighbors had voiced security concerns about having the shelter so close to their homes. In response, A-SPAN hired security officers to patrol inside and outside of the building and installed cameras. People at the shelter will be allowed to go out for smoke breaks, but A-SPAN will limit it to three or four people going on a break at a time. “Here’s the thing. 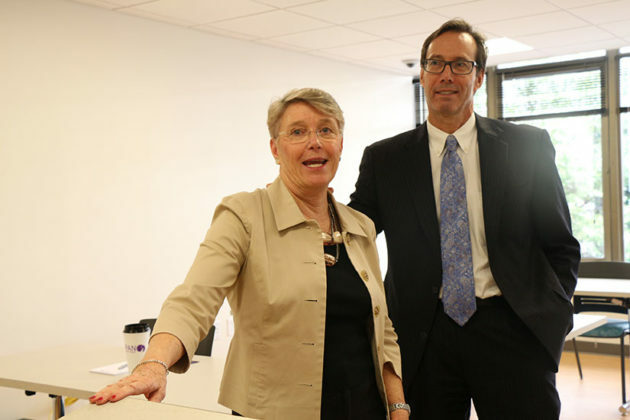 You’ve got to remember that they’re people, too,” Sibert said. There may still be occasional problems that arise, admits DHS spokesman Kurt Larrick, but A-SPAN and the County are working hard to take preventative measures. “We want to be good neighbors,” he said. Concerned residents can call Sibert or the homeless shelter to report problems, she said. There is also a Homeless Services Center Neighborhood Advisory Committee to help keep positive communication between the county and neighbors regarding issues with the shelter. The county has worked with the police department to train about half of its offices on crisis intervention techniques, which help officers identify people with possible mental illnesses and bring them to a hospital instead of jail. “Many, many officers have that training and are good at working with mental illnesses,” Larrick said. About one-third of homeless people in Arlington have a mental illness, including substance abuse or general anxiety, Sibert said, adding that the homeless shelter has therapists and doctors to help provide support. Getting people into a stable home situation also helps people deal with mental illness, Larrick said. “So many mental illnesses are treated by medications, but its hard to stay on medications when you are on the street,” he said. Ultimately, the goal of the homeless shelter is to help end homelessness by helping people get off the street and into homes, Sibert said. A-SPAN does this by providing case managers who follow each person throughout the process. “[The shelter] is really a bridge so people don’t have to live on the street,” she said.